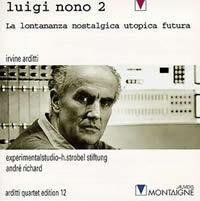 Luigi Nono was born in Venice on January 29, 1924. Gian-Francesco Malipiero was an early teacher. Nono detoured by way of a degree in criminal law from the University of Padua before he immersed himself in serious musical studies with Hermann Scherchen and Bruno Maderna. His star rose quickly. By the time he was 30, Nono, along with Stockhausen and Boulez, was a fixture at Darmstadt and one of serialism’s most charismatic proponents. He married Arnold Schoenberg’s daughter Nuria in 1955. A great deal of his early works reflect deeply felt political views, e.g., Il canto sospeso (1956), for vocal soloists, chorus, orchestra, piano and tape, the texts of which come from resistance fighters’ letters. With the 1980 string quartet Fragmente – Stille, An Diotima, his music grew increasingly enigmatic, fragmented and, most surprisingly, quieter. Still passionate about philosophy and music, Nono had embarked upon a quest to discover new sounds, especially those on the brink of inaudibility. Electronics became crucial to his work, as were close partnerships with performers and other composers. Nono died on May 8, 1990, in Venice. Andrej Tarkovskij (1987), La lontananza nostalgica utopica futura, Madrigale per più “caminantes” con Gidon Kremer (1988/89) and “Hay que caminar” soñando (1989). Nono and violinist Gidon Kremer met in 1987. It immediately became clear to each man that they had to work together. They committed to a fall 1988 performance date at the Berlin Festwochen. Nono invited Kremer to the Experimental Studio of the Heinrich Strobel Foundation in Freiburg. For several hours each day between the 15th and 19th of February 1988, the composer asked the violinist to improvise before the microphone. Nono analyzed Kremer’s playing. He electronically processed and manipulated the recordings, creating a final tape between June 19 and 25. As the summer progressed, Kremer grew increasingly concerned. He had committed to the new work’s creation but had not yet received a single page of music. The violinist arrived in Berlin two days before the premiere. Still no music. Nono gradually delivered one page at a time. The music was close to indecipherable. Kremer worked feverishly to decode the extraordinarily high notes and precise expressive markings. Even with the presence of Nono’s experienced colleagues from Freiburg, Hans Peter Haller, André Richard, Rudolf Strauss, and Alvise Vidolin, an eleventh-hour crisis loomed. The composer’s confidence evaporated. He doubted the tape’s content. The technical challenges required for playback appeared insurmountable. He wanted Kremer to play the 45-minute La lontananza nostalgica-futura unaccompanied. After much assuaging, Nono relented. The composition premiered with violin and tapes on September 3. A second performance followed in Milan on October 2 (paired with Busoni’s second sonata for violin and piano). But Nono was not satisfied. He completely rewrote the solo part and altered its relationship to the tapes. The revisions were completed in January 1989. He even changed the title. Sciarrino, in explaining the title, describes it as “a complimentary reference to one of my old works from 1977, All’aure in una lontananza. Until then the term lontananza (distance) had only existed as a concept in Baroque poetry. The soloist’s music is in six parts, or “leggii,” so named because they’re to be distributed about the stage and audience on music stands. The score says “6 different solo parts-connections — feelings contrasting and varied.” The first leggio is two pages, the remaining five are three. The sheets are oversized, reproductions of Nono’s bold handwriting. The initial impression is overwhelming and intimidating. There are more words (instructions, expression marks) than notes. The first note, a harmonic played on the G-string, has “TASTO CRINI LEGNO” written around it. The second note, the same harmonic, has “CRINI DOLCISSIMO LONTANO SUL PONTE” stacked above it. For the third, “+ LEGNO ROTTO E LONTANISSIMO” is piled atop a fermata. Drawn on manuscript paper better suited for orchestral writing, unused staves obliterate the high notes’ ledger lines. Nono indicates the pitches in parentheses, sometimes after they occur. Note stems frequently sprout from the wrong side. Hairpins are drawn freehand, no straight lines appearing anywhere. Dynamics go as quiet as ppppppppp, a literally unheard-of nine levels of piano. Outbursts are violent as sfffff. The sound is variable for microintervals of less than 1/16 (of a tone): searching for itself or searching for the sound varying it every time. The entire tape length hovers under 61 minutes, contradicting the indicated 45-minute duration. Another inconsistency: Despite the final title printed on the score, Ricordi’s press material perpetuates the rejected 1988 designation. channels 1 and 2: very dense harmonic material; channels 3 and 4: untreated violin sounds with different styles of playing, single notes and fifths; channels 5 and 6: noises from the studio: voices, words, doors, and chairs, etc., as well as violin sounds; channels 7 and 8: high lines, harmonic melodies, fast tremolos, spiccato and jété passages.” Material from one group frequently spills over into another. As the tape rolls by, the sound engineer decides which channels to put out, responding to the violinist. Favorite pre-recorded sections may fall by the wayside should the live musician delay an entrance or adjust a tempo. As if typeset directly from uncorrected scribbles, a tantalizing instruction reads: “The score — indications of the 8 tapes (never all together, but one only or -a 2-a 3-a 4-a 5-a 6-a 7-a) — will be delivered with the tapes.” So we know that all eight channels are never to sound at once. Sadly, Nono never shared anything indicating the tapes’ contents. In Madrigale per più “caminantes” con Gidon Kremer, wandering is not just interwoven into the title, the soloist must physically walk around during the performance. should be placed on 6 music stands arranged on the stage (and in the audience as well), irregularly and asymmetrically, never near each other, but in such a way as to permit free although never direct passage between them, the players searching them out. Six freely distributed music stands are required for Nono’s next and final completed composition, the violin duet “Hay que caminar”soñando. The duet’s three movements are each played from a different location, the violinists moving during the pauses. I’ve seen one performance: Mark Menzies, violin, with Nono student and composer Lachenmann at the mixing desk (New York City, April 5, 2001). Eight or ten music stands arrayed about an empty stage are disconcerting. Who put them there? Is this a rehearsal? In a performance, the violinist enters a few minutes after the tapes start. He literally stumbles across the stands, some supporting large sheets, and he begins to play uncharacteristic violin music. Depending upon the stands’ placement, the violinist may move into the audience. He can appear forlorn and distracted, definitely not in control. The vigorous tape with its numerous violins is a caged animal trying to break free; the soloist meekly roams across the stage and audience. The score insists: “[La lontananza] is not in any circumstance a concerto for solo and accompaniment.” There is nothing flashy or conventionally virtuosic. Exceptionally difficult, this is not “la campanella,” a showpiece, or a strolling violin piece. Concert violinists are not used to walking around. It is easy to overact or feel self-conscious. Physical posture and carriage are important. The score directs that the player sit down near the first stand. Seated, he would be further diminished. This is music that must be played standing upright. No other composition with a solo violin completely stamps out the musician’s ego. The tapes start first. The soloist’s first note is a harmonic played piano. The pre-recorded sound can upstage or overwhelm the soloist. Frequently you see bow and fingers moving but hear nothing. Even when the sound engineer chooses silence, the tapes’ absence oppresses. Despite the appearance of happenstance, the music is so taxing and difficult to decipher that it must be practiced beforehand and cannot be sight-read. Perhaps we are to understand that the musician knows the music, but not when to play it. There is something noble about playing music you stumble upon. Conveniently, the soloist has a violin ready. We hear many violins but see only one. We also hear skidding metal furniture and other noise, but the soloist is the only thing in motion. La lontananza is possessed with the absurd drama of a Beckett play. Kremer contributed the closing gesture. The tapes perpetuate the violinist’s final pitch, a high G (for Gidon? ), played while he departs the stage as if continuing his search. The pre-recorded sound has the first and last word. The tape is universal, the violinist a visitor, wandering at the mercy of whatever power has distributed the music. The stage is as it was at the beginning, bare except for the music stands. In a live performance, it’s a lightning strike when the two forces approach simultaneity. Kremer’s shadow looms over every violinist. 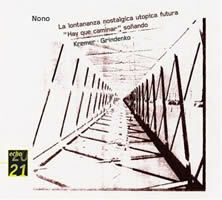 Nono said the tapes contain “1,000 Gidons.” Remarkably, Nono managed to dampen Kremer’s individuality. Subsequent fiddlers require secure personalities and quality equipment to compete against the Latvian-born violinist’s sound. Possibly the composer’s filtering and manipulation makes his sound intentionally hard to match. However, a good playback system can show up the soloist. When I saw La lontananza live, the violinist’s instrument was no match for Kremer’s. Differences were shrouded by the varied acoustics surrounding each music stand. In his late works, Nono consistently pushed musicians to new extremes in order to discover new sounds. The Arditti Quartet perfected a ridiculously slow bow-speed to play his string quartet Fragmente – Stille. La lontananza’s violinist breaches frontiers with extremely rapid arpeggios and morbidly tentative high notes. At the initial recording sessions, Nono persuaded Kremer to improvise, a skill entirely outside his Oistrakh training. Delivered hours before the premiere, La lontananza’s original solo part was nine pages. Nono and Kremer cut and rearranged it into six sections. Possibly the notes themselves are not as important as the physical state which the musician must attain to play them. Nono would construct his next composition, the violin duet “Hay que caminar” soñando, from La lontananza’s solo part, reassembling the six leggii into three duos. Verdi’s scala enigmatica would also reappear. At his death, Nono had begun a second string quartet for the Ardittis. He was deriving its material from “Hay que caminar” soñando. 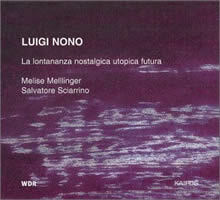 Like the Toledo motto and the scala enigmatica, “infinite possibilities” is another theme that flows through Nono’s late works. The phrase appears explicitly in the title of a 1984 orchestral work, A Carlo Scarpa architetto, ai suoi infiniti possibili. In most works for tape and instrument, one is immutable while the other must compensate. Both forces are variable in La lontananza, probably the Venetian’s only fully notated “open work.” Nono completed definitive versions of score and tapes. Yet the sound engineer selects the channels to broadcast while the violinist discovers his promenade and determines when to commence each section. Presumably the music stands’ locations can be determined by anyone, even left until the last minute. The violinist really can be made to wander through space looking for music. Other compositions were never finalized. Constantly searching for barely audible sounds, Nono perpetually adjusted his music during rehearsal and on tour. The quasi-opera Prometeo differed in each venue. Nono also leaned heavily upon individual performers and their abilities. Extensive work and rehearsal went into many compositions’ creation, musicians and composer discovering the new music side by side. Where some composers might write “flute” or “soprano,” he might indicate the player’s name. Several works required his presence for their realization. A few were never entirely notated. Découvrir la subversion: Hommage à Edmond Jabès (1987) and Post-Prae-Ludium no. 3: “BAAB-ARR” (premiered the day after La lontananza) can no longer be mounted because their scores are incomplete, their performance practice perishing with the composer. Have you ever heard music being composed? Sciarrino perceives La lontananza as Nono’s diary because it contains evidence of its creation. The recorded sounds capture Nono and Kremer, perhaps others too, talking and laughing. The tape is the work’s soul. We hear music being discovered alongside life’s mundane noises: moving furniture, something falling, doors opening and closing. Sciarrino points out the trains, audible once you know they’re there. (Very clear at 53:27 on Merkel / Heiniger.) Electroacoustic trains suggest Pierre Schaeffer’s 1948 musique concrète milestone Étude aux chemins de fer. Trains must also have had associations for the Venetian resident. Nono’s fears for the Berlin premiere came to pass in Milan. The image of the ineffectual composer at the controls is pathetic and affecting. Kremer does not mention the flawed playback in his recording’s notes. “Utopica” appeared in the title after this incident. In La lontananza violinist and sound engineer are equal partners. The only ego at work is Nono’s. His voice is an indelible part of the tapes. He finalized the sounds, solo part, and performance rules. 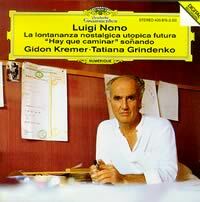 La lontananza is Nono’s attempt at immortality, an idea I’m sure he would have vehemently rejected as preposterous. Irvine Arditti (violin), André Richard (sound projection), rec. 12/1991.Naïve Montaigne MO 782133 (1992, 2003). 59:45. Dist. in the US by Naxos (http://www.naxos.com/). Even before listening, it’s mighty evident that Kremer’s release is special, finishing at two-thirds the length of the others. 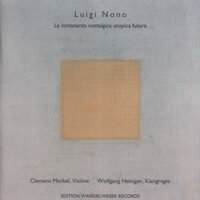 There’s another big difference: “The final version of this tape, based on the solo part recorded by Gidon Kremer, was prepared together by Sofia Gubaïdulina and Gidon Kremer in Freiburg.” As the DG recording bears the note crediting the Heinrich Strobel studio, it’s not clear whether Kremer’s tape is derived from Nono’s tapes or the original sources Kremer recorded in Freiburg, the Strobel credit appearing purely as courtesy. Kremer is uniquely qualified to tamper with La lontananza. No one else would dare disregard Nono’s wishes. Reserving the studio noise until later, Kremer prefers to float over countless copies of himself, as if preening before funhouse mirrors. When the voices, falling objects and dragged chairs finally appear, they’re interruptions rather than an essential thread. I don’t hear trains. 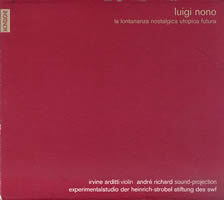 Richard knows Nono’s late works better than anyone, and Arditti realized a perfect Fragmente. Their version respects Nono’s intentions most zealously. Arditti’s sound is distinctive, characterized by fearless bravado. He towers over the pre-recorded sounds, hurling out coarse gestures as required. Richard oversees the best opening, a dense onslaught of Kremers. Merkel and Heiniger go for new ground, finding fresh relationships between instrument and recorded sound. Heiniger is not afraid to let the tapes fall silent. In fact, the work comes to a standstill during an extended tape hiatus when Merkel also employs lengthy pauses. Studio noises are a vital part of their world. At several points the tape unleashes a ferocious racket, obliterating the generally prominent soloist. Heiniger effectively uses quick fades simulating a jumping and stuttering taped violin. It’s hard to pick just one or rank all four. By design, La lontananza ought to be different each time. Sciarrino relates that his recording was selected from five takes. The Mellinger / Sciarrino has the fantastic Kairos sound which best represents the violinist’s different locations. The tapes sound great in the Arditti / Richard. Merkel / Heiniger stride away confidently in a different direction. Bending the pre-recorded sounds to his will and finishing 20 minutes earlier, Kremer’s version is still valid. Fanatics will want to read his essay on the work’s creation. It’s easier to pair these so that two contrasting releases suggest La lontananza’s infinite possibilities: Mellinger / Sciarrino with Merkel / Heiniger or Arditti / Richard with Kremer. Kremer’s has the extra room for “Hay que caminar” soñando (with Tatiana Grindenko), though La lontananza demands silence at its end.
. We conversed in the lucid moments that escaped the clouds of dull listlessness that Nono’s illness brought with it. Sometimes attacks of sleepiness would interrupt the words of a sentence and its meaning slipped away, toward dreams, toward that deepest core of pleasant warmth that then intermittently set in motion the desire to speak and rise back up again. “It is no coincidence that the death of people close to us does not strike us in our youth. They are events with enormous after-effects that create themselves to some degree: the end of time or temporality, the time whose passing [becomes] noticeable little by little.
. We were bound more by a secret feeling of complicity than by friendship. Rarely did we exchange even one idea. We understood each other more through silent empathy; we thus conferred a great deal of attentiveness on each other.